Round poly foam joint filler and backing for sealants. Provides controlled depth for sealants. Compresses easily for accommodating joints of varying widths. Does not stick to sealants. Exceeds ASTM standards for bond breaker materials. Consists of both open and closed cells on the inside with a skin-like outer texture. Non-stick closed cell skin. High moisture resistance. before sealants are applied. Joint or opening should be clean and dry and free of obstructions. Install backer-rod using a blunt probe or a plain faced roller to force the rod to the desired depth. 3. Compress to a depth of about 1/2 of the width measured at the crown of the backer rod. control the depth at which the rod is placed. 5. Don't stretch, puncture or tear backer-rod during installation but gently force into the joint so that the backer-rod fits tight against the sides of the joint. 1. Follow suggestions for joint-sealant application as directed by sealant manufacturer. 2-1/2 in. DIAMETER POLY BACKER ROD, CLOSED CELL, NON-STICK SKIN, 6-FOOT PIECE. PRICE/PIECE. Special Sale ! (color could be white, gray or charcoal; not selectable). 2-1/2 in. 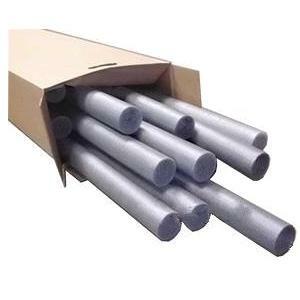 Backer Rod, SOFT 6 Feet/Piece, Carton/144 ft.